Architect Simone Testi designed the new showroom Refin Studio in a space into the heart of the Brera design district staged in the 1990s by Sottsass Associates. His presence is intense, very colorful and striking, and makes the space a surprising and unexpected place. 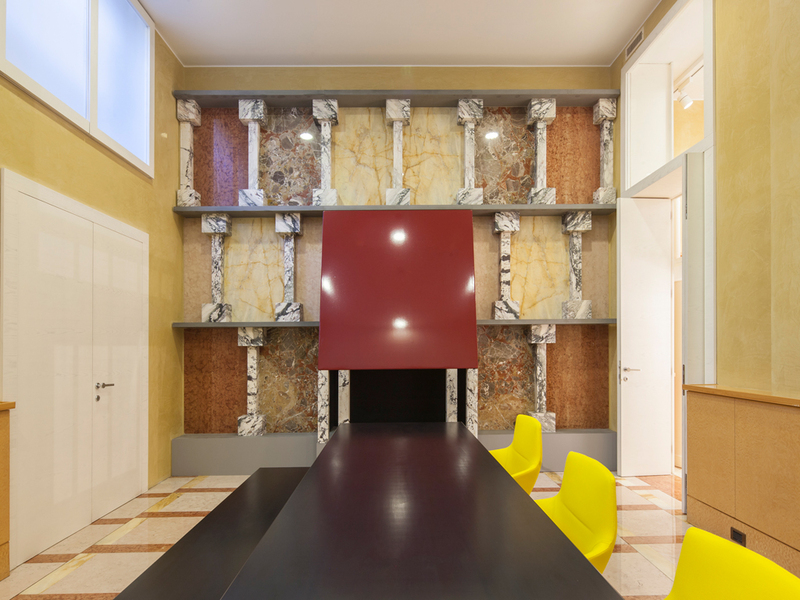 The design by Sottsass Associates was built on some iconic elements, some of them repeated in all the rooms to direct the views, like the inlayed modules of marble on the floor and the wooden paneling boiserie around the whole perimeter. The original elements held the stage of the rooms differentiating them. “It is a showroom within a showroom,” declares Simone Testi “where the new design elements interact with the preexisting ones according to a project that brings out the best of both”. 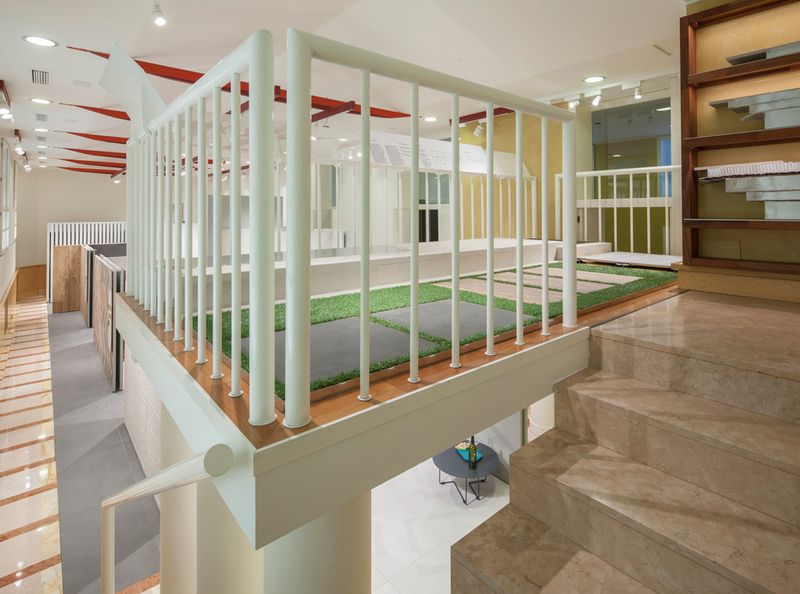 A big well integrated into the floor and protected with glass creates a feature in the first room that extends under the yard where the well used to be. 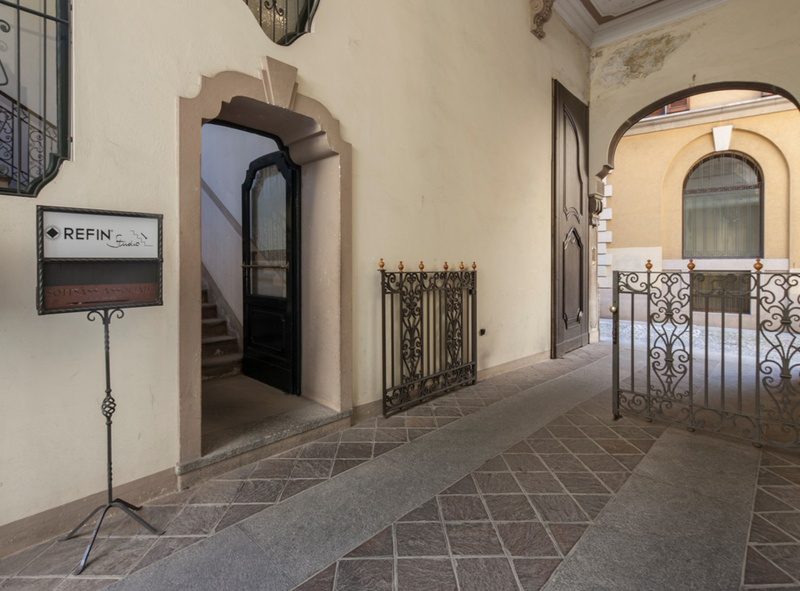 This room, named indeed Well Room (Sala del Pozzo), is now a technical area where the company’s product range is presented and where meetings and seminars will be organized. 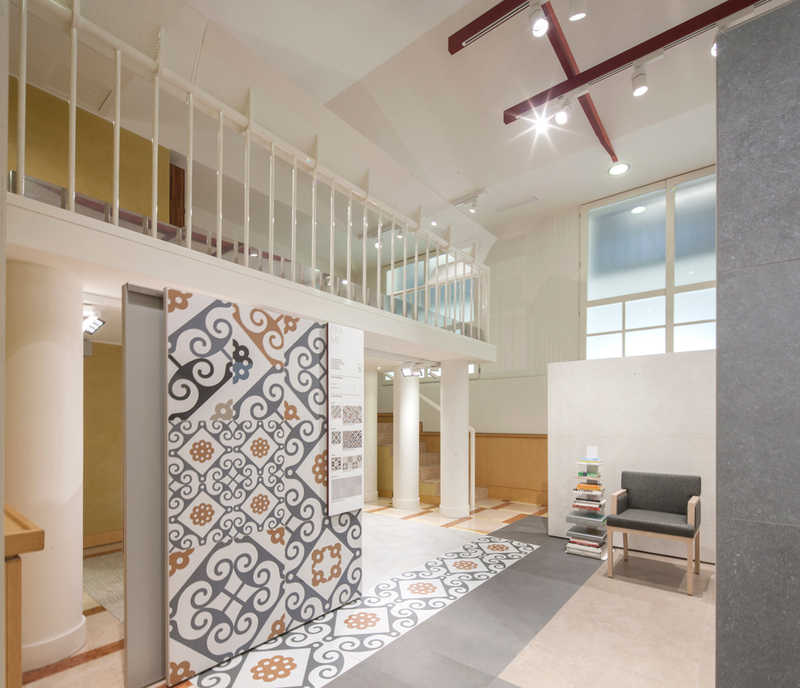 The space maintains for the most part the original flooring, adding only two strips of white tiles near the display helping to better experience the ceramic products, isolated from the context. The big display cabinet showcases the company’s full range: it is a physical catalog, made of color chips, loose pieces and all the communication tools available to present the company’s huge selection of products. A large sculptural fireplace made of polychrome marble fills the entire wall of a room in the centre of the showroom becoming the pulse of the entire location. The Fireplace Room (Sala del Camino) is an independent entity, an autonomous environment for relaxing. The fireplace fills the room leaving space only for a large table which equips the space and makes it functional both for a moment of rest and for having a meeting, with enough comfortable chairs to be used for both. A two-layered false ceiling, some large windows that gather light from low openings onto Via Melone and a small platform (stage) at the end are the elements which define the main exhibition space: the Perspectives Room (Sala delle Prospettive). As its name reveals, this is a room with a strong perspective, though asymmetrical, defined by the balance between the different elements used to create it. 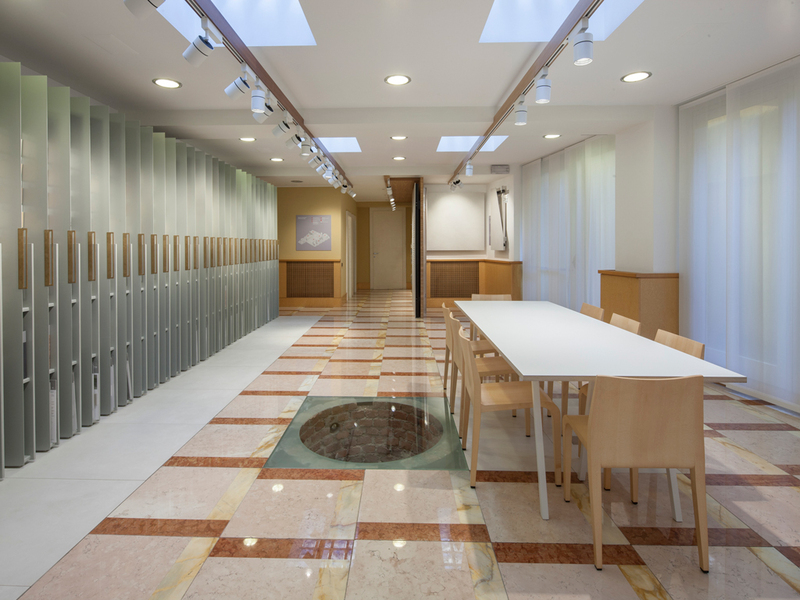 The design elements by Sottsass Associates maintain the function of containing showcase, within which the porcelain tiles are exhibited. The marble floor is still intact around the whole perimeter framing the display, strengthened by the wood paneling. Self-standing rotating wings covered with porcelain tiles are set up in the centre of the space; the ceramic panels can define different spaces and create dynamic ever-changing settings making it possible to change the room configuration. 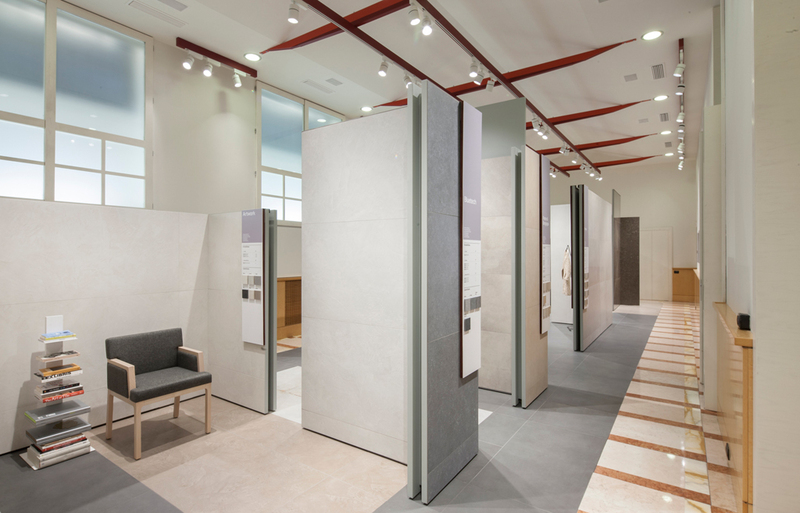 The display areas are designed to present the wide range of porcelain collections by Refin, symbolically evoking living spaces and other places and suggesting different settings and laying schemes. The lighting in the room is provided by colored beams designed to mesh with the false ceiling with which they interact directly. The upper floor of the Stage (Palco) at the end of the room is a space on its own now transformed in display area dedicated to the products for outdoor; a garden from where one can get a different perspective of the exhibiting space and a general, interesting overview of the ceramic production. 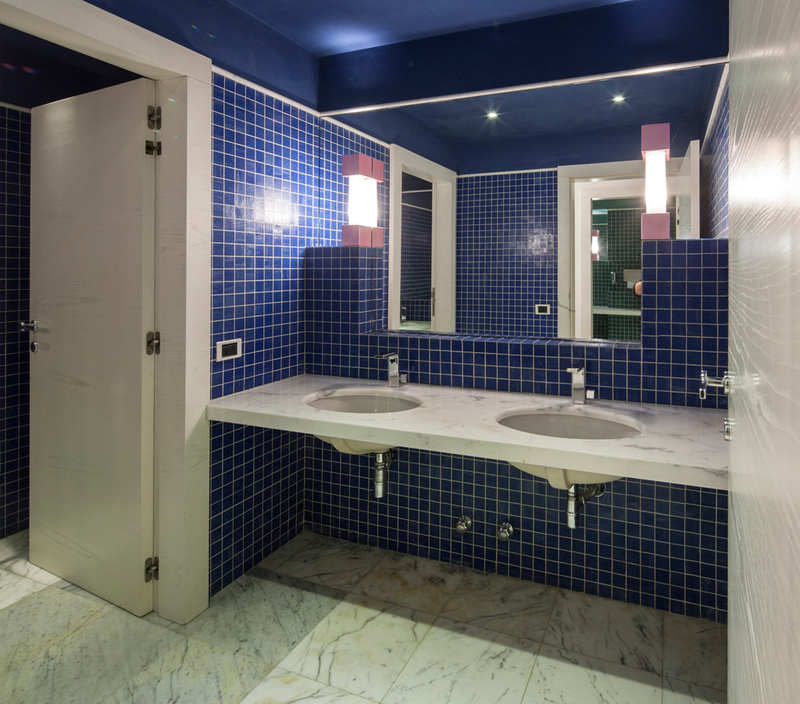 Architect Simone Testi decided to leave the original design elements also in the bathrooms: the same ceramic mosaic on the walls, in different colours, and the lamps of the mirrors, particularly simple but decorative with the bright pink colour, contrasting with the rest.